Vegetables of any sort ie. Capsicium, mushrooms etc. Preheat oven to 195▫ C. Line a 9×13 baking dish with parchment paper. In a large mixing bowl, using a hand mixer, cream cream cheese and eggs. Next, add Parmesan cheese, mixed herbs, garlic powder, and onion powder. Mix until all ingredients are well combined. Using a rubber spatula, fold in mozzarella cheese and mix until well incorporated. With a rubber spatula, spread the mixture into the baking dish, forming a nice even layer. Bake on the middle rack for 20-25 minutes. In a large frypan, over medium-high heat, combine ground beef and bacon with a bit of garlic. Cook until meat is browned. Add a few Tbs of tomato paste, mixed herbs, a few vegetables and salt. Let simmer for a few minutes. Add chicken stock then let simmer for a few minutes. Then add 2 cans of tomato. Let simmer for 15 minutes. Layer a third of the ground beef mixture into the loaf pan. Top with ¼ cup mozzarella cheese and 3 Tbs. ricotta cheese and cover with a “noodle” layer. Repeat these steps. 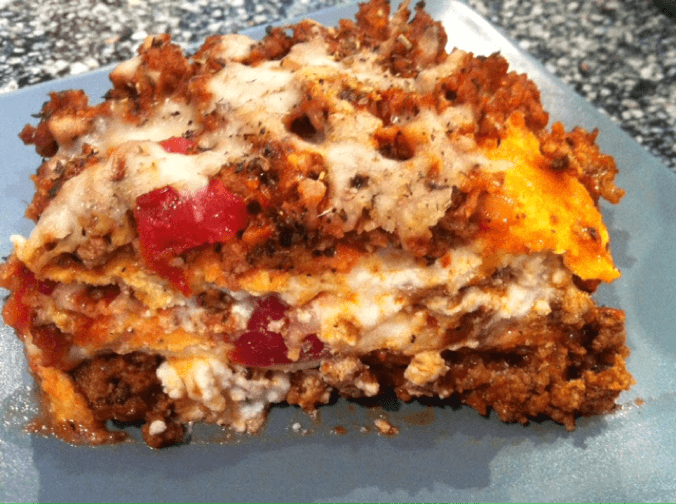 Cover the top “noodle” layer with remaining ground beef, and mozzarella cheese. Bake for 20 minutes. Notes: you can use shaved zucchini as the noodles.